Pay less and get more with this Madrid Super Saver tour! Spend the morning in Madrid to explore its attractions on a sightseeing tour by coach. This tour is the perfect introduction to Madrid's famous sights, from the Gran Via and the Castellana to the famous Plaza de España, Puerta del Sol and Puerta de Alcala.Then head to Toledo in the afternoon, Spain's medieval capital and a treasure trove of El Greco artwork. You'll discover a glorious city filled with amazing architecture as you walk along the city’s cobblestone alleyways with your guide. This morning coach tour is perfect for first-time visitors to Madrid, as it offers a well-rounded introduction to the city. 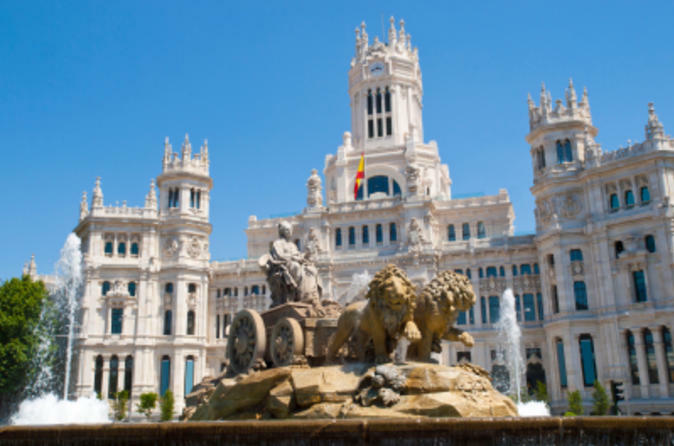 Madrid is a multifaceted city, from its Arab origins to the heady nightlife of the present-day Spanish capital – see the best of it, including the Gran Via and Plaza de España. You'll also visit the city’s historic quarters and famous parks, including Casa de Campo and Retiro. The city tour concludes at Colon Square, where you can visit the Hard Rock Cafe for a complimentary drink. The city of Toledo is a UNESCO World Heritage Site, filled with wonderful architecture that combines Arabic, Mudejar, Gothic and Renaissance styles. Surrounded by the River Tajo, the atmospheric walled town is home to many historic sites, including churches and museums. A highlight of your visit will surely be the sight of paintings by 16th-century master El Greco. Toledo was the setting for much of El Greco's artwork; see his famous The Burial of the Count of Orgaz at the Church of St Tome. On your guided tour of the city, you’ll also see the amazing 13th-century cathedral, the medieval castle, Santa Maria La Blanca Synagogue, San Juan of the Kings and the Victorio Macho Museum. Your tour will conclude with drop-off back in Madrid.